EXPEDITION NEWS, now in its 18th year, is the monthly review of significant expeditions, research projects and newsworthy adventures. It is distributed online to media representatives, corporate sponsors, educators, research librarians, explorers, environmentalists, and outdoor enthusiasts. This forum on exploration covers projects that stimulate, motivate and educate. Hawkes Ocean Technologies announced this month that the experimental prototype DeepFlight Challenger submersible is being prepared to make a record 36,000-foot dive to the Mariana Trench. The dive, planned for sometime this year, is part of the Virgin Oceanic Five Dives project, a series of ocean expeditions being carried out by DeepSub LLC. Concurrently, Hawkes Ocean Technologies is prepping two Deepflight Super Falcon craft for separate expeditions: a Hawkes-led project in the Gulf of Aqaba, Jordan, and a multi-year ocean expedition, led by venture capitalist Tom Perkins. The DeepFlight submersibles are designed and built by Hawkes Ocean Technologies, Point Richmond, Calif., a company founded by renowned marine engineer Graham Hawkes, to introduce a new generation of ultra-lightweight, cost-effective manned craft, based on the Hawkes-patented concept of underwater flight and the higher safety standards of positive buoyancy. Since the late 1990s, four generations of DeepFlight vehicles have been launched, and are now proving to be a flagship technology in enabling privately funded ocean exploration using manned submersibles. Extreme long distance sailor Reid Stowe, who returned June 17, 2010, after a record 1,152 unresupplied days at sea, has hit the lecture circuit. We recently caught up with him at the Riverside Yacht Club in Connecticut on Mar. 18 where he told an audience of sailors that for the first two years of his voyage, he never had time to read a single book. He worked everyday repairing sails. In 1991, after 9 harrowing days on the North Face of the Eiger, American climber Jeff Lowe abandoned his backpack when he couldn't find any anchors at the end of his rope. Lowe untied and left the rope and his backpack behind as he free soloed the last 50 feet to the summit ridge where he was plucked off the mountain by a helicopter, just hours before a big storm would engulf the great North Face. On Mar. 25, Josh Wharton spent over two hours chopping Lowe's pack out of the ice and snow, high up on the North Face of the Eiger. Lowe was anxious to see the condition of the pack after 20 years on the mountain. Wharton delivered the frozen, weather worn pack to Lowe on the deck of the Bellevue Hotel at Kleine Scheidegg, Switzerland. Lowe was relieved to have this bit of unfinished business taken care of after all these years. Leaving the pack was contrary to Lowe's Alpine Style ascents, but necessary for his own survival on that day. A Glasgow distillery is betting that a whole lot of people will want to sip the Scotch that Sir Ernest Shackleton had with him on his Antarctic adventure. Three crates of the explorer's whisky spent a century forgotten and frozen to the rock underneath the hut he used as a staging ground for his attempt at the South Pole (see EN, August 2010) Once they were discovered, it took another four years of strategizing before the crates could be safely removed, a sojourn in New Zealand where the bottles were thawed under precise laboratory conditions, a private jet ride back to Scotland, and eight weeks of exacting analysis. Now Shackleton's Antarctic whisky has been recreated and is ready for mere mortals to drink. Whyte & Mackay, the company that now owns the distillery that made Shackleton's spirit, announced this month that it had tasted the original blend, deemed it delicious and created "an exact replica." Fifty thousand bottles will go on sale for $160, with 5 percent of each sale being donated to the New Zealand nonprofit responsible for conserving Shackleton's hut, according to Whyte & Mackay Master Blender Richard "The Nose" Paterson. His tasting notes reveal Shackleton's Scotch has "delicate aromas of crushed apple, pear and fresh pineapple. It has a whisper of marmalade, cinnamon and a tease of smoke, ginger and musovado sugar." Makes the thirstier members of the EN staff wonder whether you drink it or eat it. The Explorers Club 107th annual dinner at the Waldorf=Astoria in New York on Mar. 19 was packed with a who's who of exploration, including astronauts, mountain climbers, an ant expert, naturalists, ethnobotanists,and all matter of scientists, researchers and authors. The theme this year was Exploring 2012: The Maya Prophesy. Each talk was interspersed with The Explorers Club theme song – a stirring piece of music that makes you want to put on a pith helmet and study pygmies in equatorial Africa. EN sat mesmerized next to two young emergency room doctors, both 28, who explained the meaning of "Lover's fracture," a condition they treat on a regular basis. Also known as Don Juan fracture, it's a fracture of the large bone forming the heel that occurs when a lover jumps from great heights while trying to escape from the lover's spouse who arrives unexpectedly. Fascinating stuff, but we digress. Former Mutual of Omaha sidekick Jim Fowler throwing away his cane to celebrate his new knee, although still in pain: "It's like a Soviet tank drove over you for a few weeks." His animal presentation included a monkey named "Wilson," drinking coconut milk with a straw. Fowler warned, "We have things happening in our natural world today that are pretty scary. ... We humans can't survive unless we treat the other creatures with us (on the planet) in good shape." Edward O. Wilson, American biologist, researcher, theorist, naturalist and author, offered his praise for the 2,900-member organization, "The Explorers Club is devoted to the exciting process of exploring parts of the world unknown physically and intellectually - and that's vital to steering us through this volatile world we find ourselves in." The fast talking Wade Davis, the noted Canadian anthropologist, ethnobotanist, author and photographer, spoke of meeting five men in the desert who were down to their last liter of water and who, nonetheless, offered him tea. He joked about those forced to travel across the desert short of water: "The great thing about brake fluid is that it keeps you off the battery acid." Don Walsh, American oceanographer, explorer and marine policy specialist, said, "On Spaceship Earth, there are no passengers. We're all crew." Later in his keynote address he decried the world's fisheries that are "vacuuming the oceans," and the unfortunate fact that "we have better maps of Mars than of the world's oceans." He continued, "We can't build enough ships and enough scientists to research the oceans." Walsh, who calls himself an "inner spaceman," believes researchers need to do more robotically to study the seas so they can launch a mission to "Planet Earth." Apa, a Sherpa who has climbed Everest a record 20 times, plans to bring down 11,000 pounds of garbage during the spring climbing season. Since Everest was first summited in 1953, thousands of people have climbed it, leaving behind the empty oxygen bottles, ropes, tents and other garbage that made their journey possible. Nepal has since required climbers to bring down everything they take up the mountain or lose their deposit, but debris from past climbs still litters the slopes. The team hopes to clear 8,800 pounds of garbage from the lower part of the mountain and another 2,200 pounds from near the 29,035-foot summit. Expedition members, porters and guides of other expeditions will carry the garbage down the mountain, receiving 100 rupees ($1.40) for every kilogram (2.2 pounds) they haul out. Ang Tshering Sherpa, organizer of the Eco Everest Expedition, said this is the fourth year a cleaning expedition has been held. He shares some of the details with EN: "There are 22 climbing team members consisting of seven Americans, eight Indians, three Brazilians, one Japanese, one Spanish, one Mexican and one Swiss. Eco Everest Expedition's advance team staffs are already at Base Camp building platform sites for tents. "We are using 124 sleeping tents for members and staffs, seven big dining tents at BC and Camp II, five kitchen tents, two storage tents, four shower tents, one communication tent and six toilet tents for this expedition." In addition to planning what we suspect must be the biggest bachelor party of the decade for his brother Prince William, Prince Harry this month was in the Arctic supporting the Walking With The Wounded charity walk to the North Pole involving four wounded UK servicemen. At press time the prince was stranded due to cracks in the runway at the Barneo Ice Camp at the 89th parallel. Will he make it to the church on time to be best man? Stay tuned. Harry is patron of the Walking With The Wounded charity. The four servicemen, who were all injured in combat in Afghanistan, hope to enter the record books as the first disabled team to walk unassisted to the North Pole. The charity hopes to raise 2 million pounds ($3.2 million) through donations and sponsorships for the expedition. The Disabled American Veterans (DAV) is supporting a request from Sen. Sherrod Brown (D- Ohio) that the Departments of Defense and Veterans Affairs evaluate the probability of radiation exposure from a leaking nuclear reactor at McMurdo Station that may have caused cancer in veterans serving there from 1964 to 1973 during Operation Deep Freeze. "Thousands of service members may have been exposed to radioactive contamination in the air, their water and their food," said DAV National Commander Wallace E. Tyson. "The experimental, one-of-a-kind nuclear reactor used at McMurdo Station suffered hundreds of reported malfunctions over its lifetime. The same reactor was used to melt snow and desalinate seawater used by the service members stationed there for as long as 13 months at a time." For over 40 years, Bill Burke was a corporate lawyer just dreaming about what he would do in retirement. Little did he know that he would enter the record books and become an inspiration to millions around the world. At 60 years of age and keeping in mind that he had never climbed a mountain in his life, Burke, from Costa Mesa, Calif., set a goal to climb the Seven Summits, the highest peaks on all seven of the world's continents. He succeeded and at age 67 summited Mt. Everest, becoming the oldest American in history to stand at 29,035 feet and return alive. Not everybody is as confident about the likelihood of attaining such an ambitious goal. Renowned mountaineer Ed Viesturs tells GrindTV.com in an email, "The key factor is the physical endurance that will be required. I've pulled off a few doubles in my career, and everything has to fall into place - health, endurance, perfect conditions, etc. Take it one climb a time and see how it goes." It's a far cry from George Mallory's Vest Pocket Kodak camera, which by the way, went missing with Mallory in 1924.
just to get a better view. 'cause we're daring through and through. and valiant to the end. you will exit as a friend. - Adventurers Club Creed from the fictitious Adventurers Club, an attraction at Walt Disney World's Pleasure Island. How did we ever miss this place when we dragged the kids to Mouseland? It was styled after a private club for world travelers and explorers and was set in 1937. Alas, despite a rigorous online petition, the Club closed in 2009, with many props sent to Hong Kong Disneyland. Always one to admire a well-orchestrated publicity stunt, especially if it relates to outdoor adventure, our admiration goes to Carmelle Druchniak of Scout PR in New Hampshire. It seemed like a great idea: the ultimate pizza delivery to the top of the mountain trademarked as "Home of the World's Worst Weather." To bring fresh pizza to weather observers atop Mount Washington in New Hampshire, Druchniak donned three layers of thermal underwear ("...très alluring for any woman self-conscious about her caboose," she blogs) and arranged for her pizza client, Rustic Crust, to drive its wood-fired pizza oven truck to the top and throw a pizza party for the weather-watchers and researchers at the 6,288-ft. summit. The stunt a few months ago required the help of a snow tractor. The folks at the Observatory were gung-ho for this bit of PR derring-do, since their first-ever take-out dinner also marked the start of a partnership between the non-profit Observatory and Rustic Crust. Druchniak joked she trained in advance by eating a raw-meat diet in the event of a Donner Pass-type scenario. "I even made a mental list of my traveling companions, and decided the CEO would be the last on the menu, since he signs my checks. Bad news for the field marketing manager, who'd be the first to go." The 42-year-old Swedish explorer Johan Ernst Nilson has embarked on a yearlong expedition from the North Pole to the South Pole titled Climate Neutral - Pole2Pole. Nilson's journey of some 12,000 miles starts with a 124-mile walk on the Arctic ice of the North Pole to the Svalbard Archipelago in Greenland. He will then navigate across the Arctic Ocean to Ottawa, and cycle six months through North and South America, passing through major cities such as New York, Philadelphia, Washington, and Austin. He'll trek the Amazon Jungle before arriving in Patagonia. Finally, he plans a two-month journey in Antarctica on skis and a parafoil, to the South Pole. The expected duration of the expedition is a year. According to the Wall Street Journal (Mar. 21), he's become a darling of various sponsors. Last month, Nilson traveled to Geneva where Zenith is unveiling a watch in his honor that also celebrates the 100th anniversary of Roald Amundsen's South Pole expedition. "A trio of sailboat adventures gone bad in recent weeks have me thinking about the limits of adventure in this modern day. Four Americans on a sailboat headed into "the most dangerous waters on the planet" off the coast of Oman are grabbed by pirates and killed. Days later two Danish families, including three teenagers, sailing off the coast of Somalia are taken hostage by Somali pirates and are held for ransom somewhere in the desert. And off the coast of Antarctica a trio of sailors die when their 48-foot sailboat, the Berserk, ices up in a monstrous storm and sinks to the bottom of the Southern Ocean. "I am the first to encourage an adventurous life. But good adventuring includes knowing your limits and possessing some kind of personal radar to help recognize the boundaries between adventure seeking and foolhardiness. "Really? That is your dream? To sail into the most dangerous waters on the planet, be kidnapped by a gang of thugs and shot to the death in the galley of your sailboat? In retrospect, of course, it sounds far more like a nightmare." Climate change and the threat of extinction emerged as the core issues in the first round of $25,000 Youth and Expedition Grants (totaling $50,000) sponsored by Eddie Bauer, the Outfitter of the Explorers Club. Chosen by a committee of Club members and representatives from Eddie Bauer, recipients were awarded at The Explorers Club Annual Dinner in New York on March 19, 2011. Jan F. Gogarten – "How Will Climate Change Interact with Disease Dynamics to Affect Wild Primate Populations?" James B. Voirin – "Shielding from Extinction the Pigmy Three-Toed Sloth of Escudo de Veraguas Island, Panama"
Gregory Deyermenjian FN'88 – "2011 Paititi/Pantayqoya Expedition"
Nathan K. Lujan – "Aquatic Inventory of the Rio Mamore: Last Untouched Corner of the Amazon"
David G. Buck – "Climate Change, Environmental Contaminants, and Ecosystem Health in the Maya Forest Region of Mesoamerica"
Said Neil Fiske, president and CEO of Eddie Bauer, "Eddie Bauer has been an important part of The Explorers Club long before this grant program was conceived. Members have relied upon Eddie Bauer gear and apparel for decades to survive some of the most extreme climates on Earth. We each share a mission to promote a spirit of adventure and discovery, and we are proud to support both the current and next generation of explorers as they extend the frontiers of knowledge and geography," said Fiske. Has it really been that long? On May 1, 1986, the Steger International Polar Expedition went down in history for making the first confirmed dogsled journey to the North Pole, without being re-supplied along the way. You Want to Go Where? - How to Get Someone to Pay for the Trip of Your Dreams - The only book that not only takes you behind-the-scenes of some of the most historic and modern-day adventures and expeditions, but also provides advice on how individuals can fund and arrange their own trips. 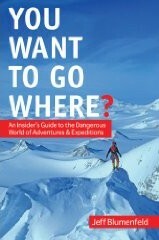 EXPEDITION NEWS is published by Blumenfeld and Associates, Inc., 28 Center Street, Darien, CT 06820 USA. Tel. (+1) 203-655-1600, fax (+1) 203-655-1622, editor@expeditionnews.com. Editor/publisher: Jeff Blumenfeld. Assistant editor: Jamie Gribbon. ©2010 Blumenfeld and Associates, Inc. All rights reserved. ISSN: 1526-8977. Subscriptions: US$36/yr. available by e-mail only. Credit card payments accepted through paypal.com. Read EXPEDITION NEWS at expeditionnews.com. Enjoy the EN blog at ExpeditionNews.blogspot.com. Layout and design by Nextwave Design, Seattle.